pacu borracha, tambaqui, piratinga corvina fishing. Fishing rods: with 5’6’’ length or 6’0’’ fast action between 8-17lbs or 10-20lbs. Reels: low profile reels for mid water lures and round profile ones for surface lures for Tambaqui and Pirapitinga fishing. Both should bear 330 feet of line 0,37mm or 0,40mm. Low Profile: Curado, Calais, Chronarch, Contender SS, Contender 8000, Urano 6000, Ventura, TDX E TDZ 100. Round Profile: Millionaire 200 CVZ, Millionaire 253 CVZ, Calcutta 150, 200, 250. Midwater lures: Sizes from 9 to 11cm are preferred with ratlin (sound effect). Example of productive lures: Shiner King 90, Inna 90, The First 90, Duel Aile Magnet. Examples: Zetta110, Viper110, Aile Magnet. Light colors in general. Subsurface lures: long dewlap Crank kind and sizes from 3 to 5 inches. Metal jigs MS super jumper 11,2 and 10,2cm (ideal for Cachorras and Corvinas) and power Shads 110 and 120 from Marine Sports. Lines from 20 to 24 lbs of special resistance for artificial baits. Example: Super Bass, Lídes Super Raiglon transparent 0,47mm. Fishes: jundia, piranambu, caparari, cachara, barbado, armau. Fishing rods: 6’0’’ to 6’6’’ length. Fast action for lines of 15 to 45lbs. Reels: with120 to 150 of 50lbs (0,50mm) line capacity. Example of reels: Millionaire 300 CVZ or S. Calcultta 400, Magna 5000. Lines: Super Raiglon and Super Nylon Marine Sports of 50lbs of resistance (0,50mm). Hook: Long shank hook model 1971N size 7/0 or 8/0. Flexible steel cable ties size 45cm to 60cm (spinner #3) and 7lbs resistance. P.s: The material above can also be used to catch big fish such as: Pirararas, Jaús and piraíbas, but we warn that it is only possible when the fishing local is the despraiad part of the river and the fisherman is on board, in places of fast flowing and rocks this material is not recommended. Fishes: piraibas, pirararas, jaús, capararis. Fishing rods: 6’6’’ to 7’0’’ length. Fast action for lines of 40 to 100 lbs. Reels: With 100 to 120 of of 0,80mm or 0,90mm line capacity. 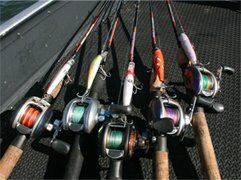 Example of reels: Daiwa 45 SH, Shimano Calcutta 700, Penn 310, Black max 30 Marine Sports. Hook: Long shank hook model 1971N size 10/0. Flexible steel cable ties size 45cm to 60cm (spinner #1/0) and 100lbs resistance. P.s: We do not recommend the use of tie made out of stiff wire. The sinker used is provided freely by the Lodge. ATTENTION: LOOKING TOWARD YOUR FISHING SUCCESS WE HAVE AT THE LODGE A SHOP ALL THE NECESSARY MATERIAL FOR YOUR FISHING TRIP . Baits, hooks, reels, fishing rods, lines, fishing clothes. A lot of the materials above mentioned are only used in our region(heavy) in order to offer great savings to our clients , this kind of material is available at our Lodge, the cost of the same material elsewhere is about R$1500,00. (This material adds to the success of your fishing trip). About our prices, we can guarantee that are in the same or lower than the local competition. The greatest advantage is: the fisherman will only buy what is really needed, avoiding buying unnecessary material.